Read the testimony presented by Heather O'Loughlin in support of House Bill 425 - Revise and make permanent Medicaid expansion and opposing House Bill 658 - Generally revise healthcare laws and permanently expand Medicaid. Read Heather O'Loughlin's testimony in support of Senate Bill 18 - Establish workforce housing tax credits. Read the full text from Heather O'Loughlin's testimony in opposition of House Bill 148 to the House Committee on Taxation. This presentation provides an overview of budget and tax policy in Montana, the various funds that make up Montana’s budget, and revenue options to get our state back on track. 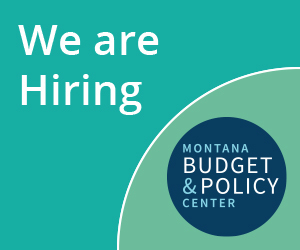 Heather O'Loughlin, co-director at the Montana Budget and Policy Center, delivered this presentation on November 14, 2018. This presentation provides an overview of the Montana state budget and focuses on the local impacts of statewide budget cuts taken in 2017. It also provides a brief outlook of the 2021 biennium budget agency base levels and budgetary pressures. Heather O'Loughlin, Co-Director at Montana Budget and Policy Center, delivered this presentation on November 14, 2018. Speakers: Heather O'Loughlin Co-Director, Montana Budget and Policy Center; Sarah Howell, Executive Director, Montana Women Vote In 2017, the state legislature cut over $350 million from the state budget. By the end of 2017, cuts to health and human services totaled $95 million in state funds, resulting in the loss of over $100 million in federal funds. These cuts have decimated many programs for Montana’s most vulnerable families, and nonprofits service providers across the state are facing greater pressure with fewer dollars. How did we get here? What might we expect in the 2019 session? How can nonprofits and the nonprofit sector play a greater role in advancing solid public policy that helps, not hurts, our families and our neighbors? This presentation will walk through actions taken during the session and how nonprofits can share their experiences to help fight for greater investments in our communities. Presenters will provide specific tools to engage its board, members, and others, and strategies to reach policymakers. This presentation"Overview of Montana Budget and Tax Structure" was given at the "Impacts of Statewide Cuts to Local Government" session at the Montana League of Cities and Towns Annual Conference on September 27, 2018 in Butte, Montana. The presentation provides an overview of the Montana state budget and focuses on the local impacts of statewide budget cuts taken in 2017. It was delivered by Heather O'Loughlin, Co-Director at Montana Budget and Policy Center. This presentation is an in-depth review of taxes and revenue in Montana. It was given by Mike Kadas, the former director of the Department of Revenue.